HSMAI San Francisco sponsored the Annual CBRE/ PKF Bay Area Forecast in September at the Hyatt Centric Fisherman’s Wharf Hotel. 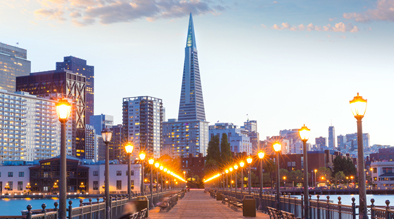 The event sparked a gathering of some of San Francisco’s finest hotels with attendance from General Managers, Revenue Managers and Directors of Sales. With the anticipated 2017 closure of Moscone Center for renovation, hoteliers are nervous as they prepare for the traditional 2017 forecast and budget season. Most hotels use CBRE/PKF content as footnotes for the annual budget executive summary and rely on their analytics for their sales and marketing strategy. Based on the graphic below, occupancy for 2017 is expected to decline, while average rate continues to increase. Overall, RevPAR while increasing is below the trend that we have seen in the most recent past, all as a result of less market demand propelled by fewer Moscone bookings. It won’t be until after 2018 that this trend is reversed, as meeting planners remain shy of construction completion dates. Oakland is experiencing a similar trend as the compression generated by Moscone events often propels demand in the Oakland market. The Graphic below illustrates the amount of lodging units supplied by Airbnb in the San Francisco market and its relationship to traditional hotel rooms. With this additional supply of Airbnb rooms, hoteliers are feeling it through slightly slower occupancy, ADR and RevPAR growth. The cyclical nature of the hotel industry is nothing new to hotel operators. It has been here before and will be here again. New competition, such as Airbnb, changes the landscape a bit though. Paying close attention to how new competitors attract guests is key. Hoteliers who prepare for the lower demand months ahead with clear, attractive, effective digital marketing will prosper and possibly increase market share by attracting guests from the competition as the perpetually online, savvy consumer shops for the best deal. This article is contributed by John Kiszla, [email protected], a hospitality and digital marketing expert in the Bay Area. If you would like to discuss more about Northern California market conditions or digital marketing for the hospitality industry email or comment below.